Last Saturday in Bath, Maine, the Zumwalt 12 prepared for their day in court by sharing draft versions of the statements they plan to make at their trial. All pled not guilty to the charge of obstructing a public way at their arraignment in July (where the photo above was taken). Some hope to sway the jury into acquitting them on the grounds that what they did was more reasonable than building a $7 billion* warship while children go to bed hungry blocks away from the shipyard. Other defendants are more interested in expressing why they chose to be arrested, and are unconcerned with the legal outcome of their trial. 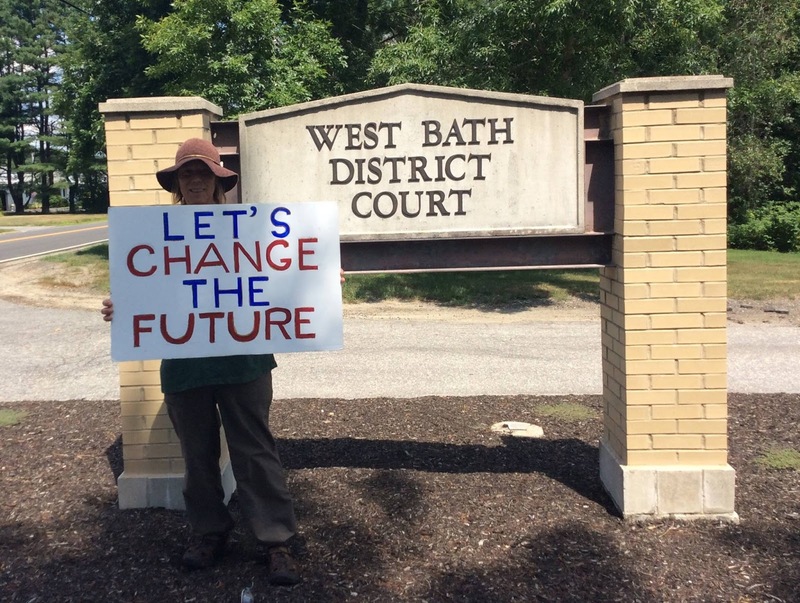 "I want this stuff to get inside them the way it is inside of me," explained Bruce Gagnon, a resident of Bath who has protested at the shipyard gates many times as weapons of mass destruction were celebrated inside. Retired public health nurse and member of Pax Christi Connie Jenkins explained how she followed the teachings of "the nonviolent Jesus" when deciding to sit down in the road and be arrested. Connie cried when she remembered the young crew in their dress white Navy uniforms who walked by and witnessed her civil resistance. She hopes that her witness planted a seed in their minds that what they have been trained to do, that is wage war, is morally wrong. Permaculture worker Jason Rawn led the Zumwalt 12 and their supporters in song prior to hearing each other's testimony about why they decided to be arrested for blocking the road. He changed the first line of Pete Seeger’s classic to “Where has all the seaweed gone?” after traveling to Jeju Island in South Korea last year to support local resistance to entombment of a soft coral reef to build a deep water port for warships like the Zumwalt. Village fishing folk reported that the bare rocks near the construction site had formerly been covered with seaweed that was an important resource for their traditional way of life. Here are statements from some other members of the Zumwalt 12. John Morris quoted the late President Eisenhower's warning that every weapon the U.S. builds represents a missed opportunity to feed and clothe cold, hungry children. 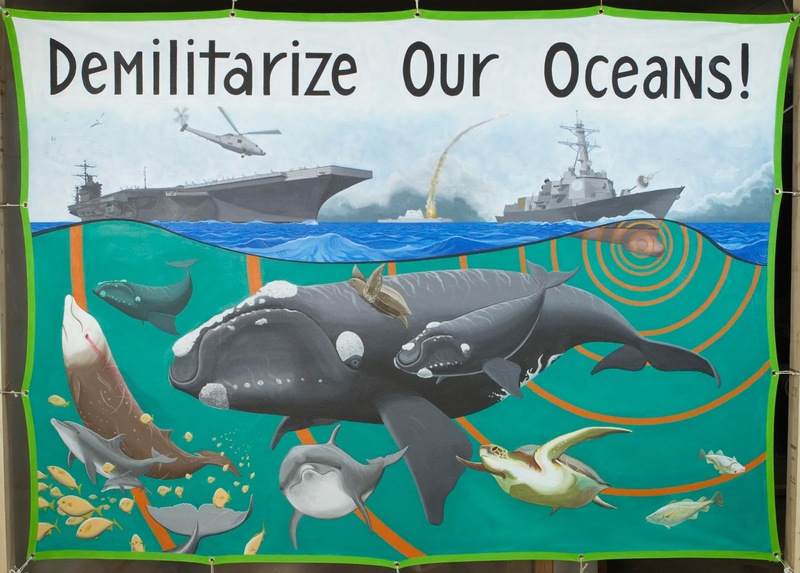 Artist Russell Wray spoke of his work with Citizens Opposing Active Sonar Threats (COAST) to oppose the Navy’s heavy use of sonar that kills whales and dolphins. Russell created the banner and sculpture that were used at the Zumwalt “christening” protest, and a dolphin hat that he donned for his act of civil resistance. Asked if he planned to wear the dolphin hat for the trial he said he was considering it but wasn’t sure the judge would allow it. George Ostensen, who lives with his family at Smilin’ Trees Disarmament Farm, shared some of the high points of the long history of civil resistance at the Bath Iron Works shipyard. Unfortunately, my video recording of this did not work, but Carolyn Coe is producing a show of the Zumwalt 12's statements to run on WERU Community Radio later this month, and Eric Herter of the Community Television Network is doing the same with his video recordings of the entire discussion. George and his family organize many of the vigils in Bath, including a series of Saturdays each Lent and Advent season. Those who wish to join the vigils should gather at the shipyard’s main gate around 11:30am in time for the shift change at noon. Thousands of shipyard workers have received flyers prepared by the Farm calling on them to build for peace, not war. Many workers at the shipyard have lobbied for conversion to building offshore wind turbines or light rail, energy solutions to reduce global warming which is already raising sea levels and flooding many coastal areas around the planet. Peter Woodruff, a retired BIW worker who is part of this effort, documented the arrests of the Zumwalt 12 in June. * Originally announced as a destroyer ship with a much lower price tag -- only $4.1 billion -- the Zumwalt project has huge overruns and consists of three ships the Navy recently announced will cost a total of $21 billion. Thus the price per ship has been calculated by the Zumwalt 12 as approximately $7 billion. Bruce shared that the Navy reportedly never wanted the Zumwalt destroyers because they would consume so much of its budget. But the Crown family of Chicago, a major shareholder in General Dynamics, was instrumental in raising the funds to get President Obama elected and thus had a man in Washington to push through the highly profitable deal at higher levels. Sanity and courage in the midst of madness.. so moving. Thanks as always, Lisa.